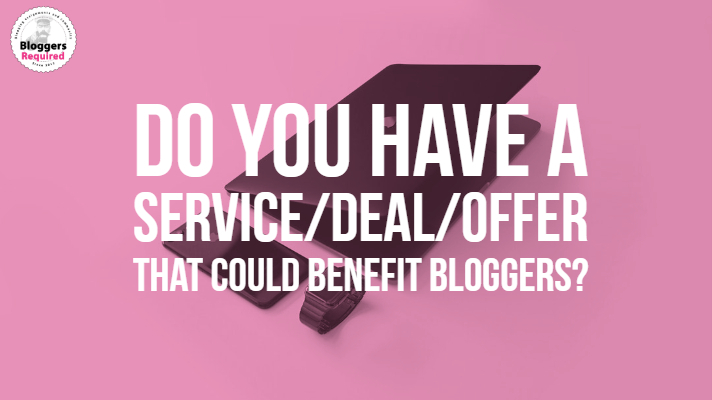 Do you have a service/deal/offer that could benefit bloggers? Add it to our site. Home Do you have a service/deal/offer that could benefit bloggers? Add it to our site. Do you have a product or service that could benefit bloggers in the Bloggers Required community? Submit them here! To submit a deal (credits, discounts, offers, codes, etc), please complete the below form. We’ll then put them all onto the Bloggers Required site for our blogging community to use. We’ll also share them socially and add them to our newsletters. Please only add deals/services relevant to bloggers/blogging. Please do not add links to resources/newsletters. Please do not add your affiliate schemes. If you are looking for bloggers to review your products, please create a blogging assignment. This is not shown on the final offer post. Add the deal details here, including any credits, discounts, offers, codes, etc. Add how to redeem your offer including any links and closing dates of the offer if applicable.